Browsing for posts tagged bread. In Portland, it seems there’s always a rush for breakfast – even at the mediocre spots. So if it’s after 10 and we want breakfast, we’ve been getting in the habit of making it ourselves. 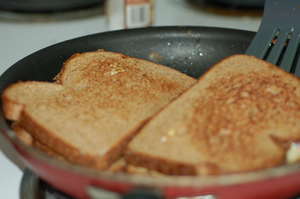 Egg sandwiches are a delicious way to whip up a quick breakfast, and can usually be made with what you have on hand. Best of all, they really cut through a hangover ;).